Could A Miracle Baby Defy All The Odds? Miracle Baby, Emmilyn, Weighing at 1 lb. and 15 oz. Who Refused To Give Up! Chyler’s pregnancy was moving right along, and everything with the baby was going great. She had twelve weeks left in her pregnancy, and she and her husband, Chris, thought they still had plenty of time to set up the nursery. However, God had his own timing! At 27 weeks, Chyler began to have horrible back pain. It was so bad that one morning she woke up crying but thought the pain was probably just the muscles in her back expanding from growing with pregnancy. Sunday night, Chyler could barely concentrate in church as the songs were sung and words were spoken. She just could not get comfortable. Her back was killing her. Early Monday morning, Chyler woke up vomiting; yet, she still went on to work. However, it didn’t subside, so she eventually had to leave work and go home. Working at a preschool, Chyler thought maybe she had just caught the stomach bug and things would be better the next day. Tuesday, she went back to work. Her and her little ones were watching a movie, and suddenly Chyler lost vision in her right eye. Chyler wasn’t sure what was going on, but she knew she felt awful. Between the throbbing back pain, throwing up, and now the loss of vision, she knew she needed some rest. She went home that night and went to bed early thinking surely things would be better in the morning. Chyler awoke on Wednesday, and she still could not see out of her right eye. She still didn’t relate it to the pregnancy. She began calling around to see if she could get in to see an eye doctor; however, no one would accept her insurance. She decided to go on into work and hope for the best. After all, on Thursday, she would be going in for her pregnancy Glucose Test so she was sure her doctor would reassure her she was going to be just fine. By the end of Wednesday evening after church, Chyler was so tired, still no vision in the right eye, horrible back pain, and now swelling badly. Thursday morning, she still went into work. She worked the entire day. Once she got off work, her and her mother headed to Fort Smith for her regular scheduled appointment. Chyler was in shock. She was just 28 weeks pregnant. Chyler was told she had the HELLP Syndrome. The chances of survival for a baby at 28 weeks with a mother diagnosed with HELLP was low. 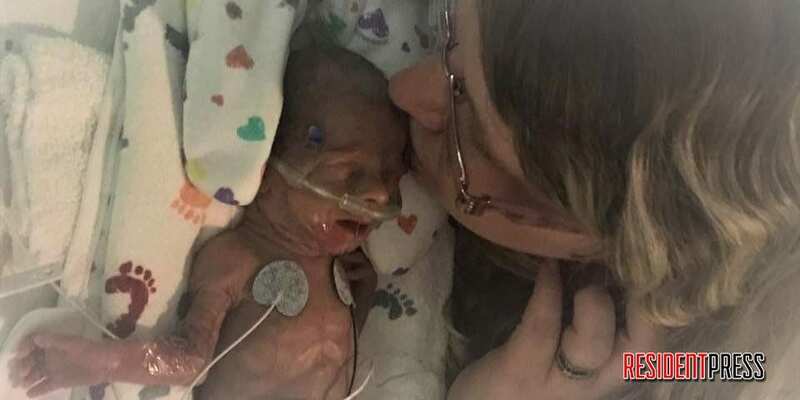 She knew she and her baby needed a miracle. As soon as the doctor left the room, she immediately got ready to leave and head for the elevators. She called Chris. “How fast can you get to the hospital?” she asked him. He still would only reassure her that she would be ok. He never would reassure her that her baby would be ok. Chyler was devastated. This is not what they had prayed for. This was not what they had planned for. What were they going to do? The doctor realized they were running out of time, and the baby needed to be delivered. Chris had arrived and began suiting up for the surgery. The doctor told them he was going to chance it, because they needed to act fast. As soon as she was delivered, Chyler saw the side of an incubator box as they wheeled it quickly out of the room to rush her baby to the NICU. It would then be twenty-four hours before Chyler would get to see her sweet little baby girl. 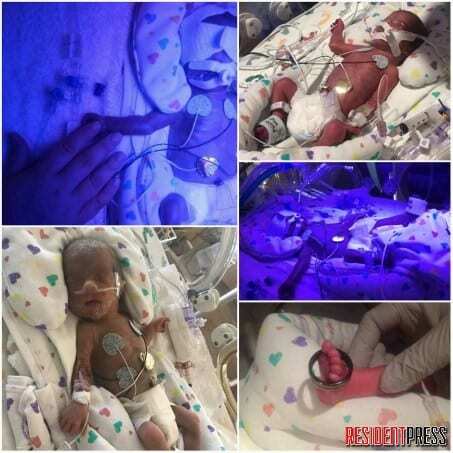 Emmilyn was born on May 4th at 28 weeks, and she weighed only 1 pound and 15 ounces and measured just 14 inches long. The next morning, the nurse practitioner came to her room and had a long talk with Chris and Chyler. Chyler and Chris didn’t know what to think or do. In a matter of hours, their entire life had just changed. They went to the NICU, so Chyler could see Emmilyn for the first time. She was on a heart monitor, oxygen and the ventilator. Chyler couldn’t believe how tiny she was! Emmilyn was a miracle baby! The first week Emmilyn was kept on the ventilator to help her breathe. Then, after the first week in the NICU, baby Emmilyn contracted MERSA. The nurses told them they figured Emmilyn had received it from the pic-line getting infected. Needless to say, this was for sure their first official setback. For the next three months, they could not touch her without gloves and wearing two gowns. It was breaking Chyler’s heart. She just wanted to hold her baby girl. Chyler was allowed several times to do a skin on skin contact to let Emmilyn get use to her mother’s scent. She would snuggle Emmilyn on her chest, but her hands still had to have gloves. They just wanted to be a family. Her and Chris would stand next to Emmilyn’s incubator box, hold hands, and pray for God to heal their little girl. After a couple of months, they tried to wean Emmilyn off the oxygen, but every time her numbers would fall. She would immediately desat. An image testing was ordered for Emmilyn’s heart, and that is where they found a ASD heart murmur. The doctors then ordered Emmilyn to be life flighted to Arkansas Children’s Hospital to have a small ligation performed to close the hole in Emmilyn’s heart. For two weeks, Chyler and Emmilyn stayed at Children’s Hospital. The first day there, Chyler’s nerves were on edge. She was scared, nervous, and just wanted her baby girl to be ok. Chyler’s brother, Chans, sent her a text with the lyrics to the song, “Hills and Valleys” by Tauren Wells. Chyler clung to that hope in the words spoken in that song that soon her baby would be healed. Every night Chris would call as soon as he got off work to check on their baby girl, and he and Chyler would pray on the phone. They continued to ask God for divine healing for their miracle baby. Chris could not wait until they came back. He missed them so much, but he knew he had to stay behind and work. She believed God would always renew us, and He would give her strength. She just had to keep walking beside Him. Finally, at three and half months old, baby Emmilyn was determined to prove doctors wrong. Children’s hospital had projected her to stay much longer, and doctors in Fort Smith thought she would need to go home with oxygen and heart monitor. However, on August 14th, after 103 days in the hospital, Emmilyn was released and ready to go home! Chyler and Chris were so excited to finally have their baby home with them. Emmilyn was truly a miracle baby! Although she had lots of check-ups with doctors, she has continued to defy the odds. Due to being on a venaltor and oxygen so long, they were told she had Chronic Lung Disease and would always need assistance. However, after two visits with the Lung Doctor, she graduated and has not seen the doctor since then! 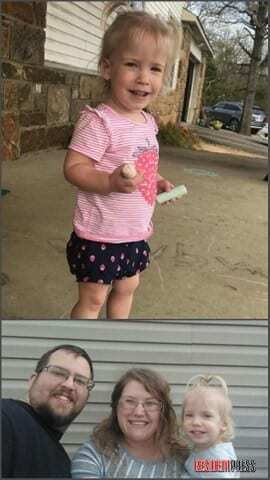 They were told after a year old, Emmilyn would need therapy to help her learn to crawl and walk, but once again, Emmilyn decided to prove doctors wrong. She started crawling while Chris and Chyler were on vacation. Then, within five months of therapy, Emmilyn was walking! She is now dismissed from all therapies. God has been so faithful with blessings one after another as Emmilyn has grown. This was truly a GodWink moment, an unexplainable miracle. God took an impossible situation and turned everything around. Emmilyn is approaching her 2nd birthday soon, and she is a healthy, blessed, miracle baby! If you have ever thought God doesn’t hear your prayers or see your tears cried, please know that God does listen, and He loves you so much. Chyler and Chris never expected the road they went down with Emmilyn, but they clung to God in the most unsure valley they have ever walked. God was faithful to them, as they were faithful to Him. If you are praying for your GodWink moment and looking for a miracle, please know that God loves you. He sees you. He hears you. He knows your name. Psalms 56:8-10 You keep track of all my sorrows. You have collected all my tears in your bottle. You have recorded each one in your book. My enemies will retreat when I call to you for help. This I know: God is on my side! I will praise God for what he has promised: yes, I praise the Lord for what he has promised. 1 Samuel 1:27-38 For this child I prayed, and the Lord has granted my request which I asked of Him. Therefore I have also dedicated him to the Lord; as long as he lives he is dedicated to the Lord. And they worshiped the Lord there. GodWink: the unexplainable moment in life when it can only be God!